In a high-intensity web marketing world, the look and feel of your website as a customer or potential customer browses through is often a reflection of what you can do and how efficient your services will be. One cannot overestimate the power of a well-designed site to attract customers like a bee to a honeypot. 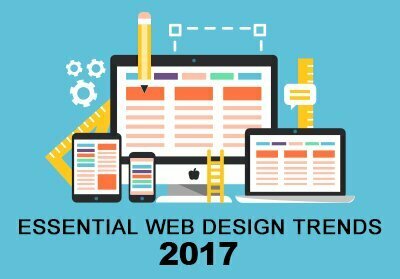 Staying contemporary with design to own a website that will dazzle your clients is a must in today’s web intensive business scenario. Professional web design is always evolving. We believe there will be the strong winds of change in 2017, here is a bird’s eye view of how the current is flowing, as we confidently embark on our design journey this year. Nothing works better for catching the human eye than attracting the visual senses. So hero images, the high resolution, brand curated ones, and well-thought, targeted typography will be used to woo customers. The video will continue to be used in content marketing with the tweaks of background video and motion graphics playing out in subtle animation to engage the customer. Custom-made Illustrations that project your company’s uniqueness and brand promise will be in vogue turning your website into a talk of the town place to visit. So, illustrations will replace old stock photos to grab the viewer’s attention. Google Material Design with its flat colors will march on with its popularity status in 2017. Though it isn’t the only approach to the web and mobile app design, its set of principles and best practices will continue the light the way for designers. It will help them to focus on what is important while still accounting for multiple resolutions and devices. Web application development coders will use maturing CSS framework and grids as the foundation for web development. This will impact delivery as they will shorten development time and improve responsiveness which makes them an excellent choice for digital projects. New front-end development frameworks such as Suzy, Jeet and Breakpoint are also getting traction and pre-made themes like Envato Market, and Template Monster have improved to allow developers to respond to customer requests and make any alternations that may be required. There is a developing trend to begin designing for mobile visual or small screen devices first and then project for bigger desktops. This kind of designing is trending as responsive designing is becoming more prevalent on account of changes to Google’s Algorithm and statistics showing mobile ascendency. Prioritizing the small screen user with a mobile apt design will be high on a designer’s must-do list. As the whole world connects over the web, more than ever before, it is important that your website focuses on the customer without a blink. If you are redesigning your existing site, clean out the unnecessary content and retain only matter that will drive business and impress the customer. You can do this by mapping key customer journeys. In case you are building a website from scratch, consider wireframes, site maps and top tasks as your starting point, focusing on clarity of information rather than clutter and completeness.